Paul Saffo of Stanford Univ., Singularity Univ. Why does Silicon Valley produce revolution after another? Conventional wisdom credits big visions, great management and a history of success, but conventional wisdom is wrong. Silicon Valley’s unique edge is built on the rubble of failure, poor management and a crucial third ingredient – myth. 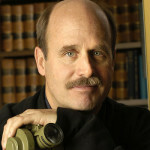 About the speaker, Paul Saffo of Stanford Univ., Singularity Univ. Paul Saffo is a Silicon Valley-based forecaster with three decades of experience helping corporate and governmental clients understand and respond to the dynamics of large-scale, long-term change. He teaches at Stanford where he is a Consulting Associate Professor in the School of Engineering, and is Chair of Future Studies at Singularity University. Paul is also a non-resident Senior Fellow at the Atlantic Council, and a Fellow of the Royal Swedish Academy of Engineering Sciences. He holds degrees from Harvard College, Cambridge University and Stanford University.